Downy mildew is a disease of the foliage, caused by a fungus-like (Oomycete) organism. It is spread from plant to plant by airborne spores. It is a disease of wet weather as infection is favoured by prolonged leaf wetness. 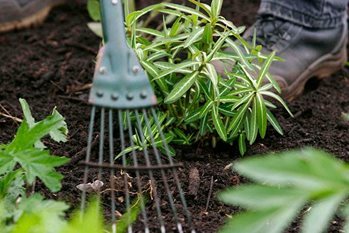 A range of common edible and ornamental plants can be affected, including brassicas, carrots, columbine (Aquilegia), foxgloves, geum, grapevines, hebe, busy Lizzie (Impatiens), lettuce, onions, pansies, parsnips, peas, poppies, rhubarb, roses, spinach and tobacco (Nicotiana) plants. Downy mildews usually have narrow host ranges comprising of just a few related plants. For example, the downy mildew affecting brassicas is a different species from the one attacking pansies. Resistance: Cultivars with resistance to downy mildew are available for some vegetable crops, such as lettuce and onions. Check the latest seed catalogues for information on the cultivars available. However, the disease resistance can break down if the downy mildew mutates to produce a genetically different ‘race’, so growing a resistant cultivar does not always guarantee freedom from infection. The situation with lettuce downy mildew is particularly complex as there are many different races, and new ones emerging all the time. Spinach is similar in this respect. There are no fungicides available to amateur gardeners for use against downy mildews. Downy mildews are caused by microscopic, fungus-like (Oomycete) organisms. Despite a similar name and certain similarities in symptoms, they are unrelated to the powdery mildews. The disease is spread by spores produced on the underside of infected leaves. These spores are splashed by rain, and are also sometimes carried for long distances on the wind. Extended periods of leaf wetness are required for infection, so severe outbreaks of downy mildew are only likely to occur outdoors during wet summers. Where plants such as lettuce are grown in glasshouses, the disease may be present throughout the year and can cause major problems in spring and autumn, as it is very difficult to control humidity and leaf wetness at these times. Many downy mildews produce their spores at night, and extended periods of high humidity or leaf wetness overnight can lead to severe outbreaks. The airborne spores remain viable for just a short time, but most downy mildews also produce a second spore type (a resting spore known as an oospore) within the affected plant tissues. These resting spores are much more resilient. They are released into the soil as the diseased material rots down, and are likely to survive for an extended period (up to five years). If the host plant is grown again in contaminated soil while the resting spores are still viable, they may infect it through the roots to cause a systemic infection (one that spreads throughout the plant).